Continuing our experiments with making two different sandwiches and sharing them, and exploring new sandwich combinations. Today’s combination were “egg salad” with watercress and pastrami with mustard. Watercress adds 5c per serve. The sandwiches today were interesting, although we overdid the labné in the egg a little. Lunch today cost $2.07 with good variety. A continuing streak of hot weather swings the balance in favor of cold salads, again. 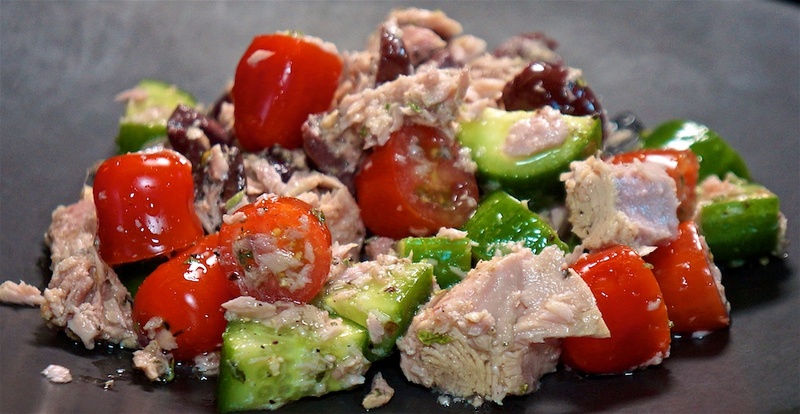 It’s somewhat challenging to find a variety of salads that aren’t “another leafy green salad.” Tonight’s contender is a Greek style tuna salad, for which we had reasonably low expectations. Add 25c for the seasonings. This salad exceeded our expectations. It was much more tasty than the simple ingredients would suggest and it comes in at $4.33 per serve.